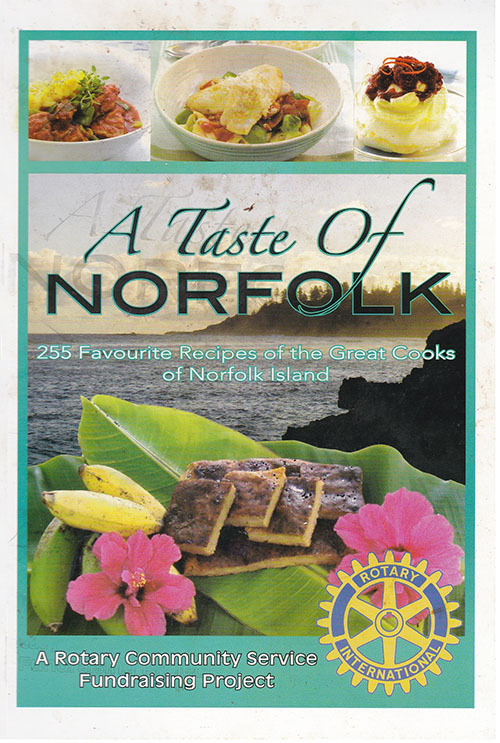 The Norfolk Island Cookbook is a Rotary Club of Norfolk Island fundraising project. First published in 1998, the Cookbook has undergone various editions and has sold literally thousands of copies since then. Priced at only $15, the Cookbook is available, on Norfolk Island, through many outlets, and is available for purchase direct from us. Over 120 pages of recipes, compiled by wives and partners of Norfolk Island Rotarians, the recipes represent a variety of popular family recipes using basic ingredients. Those of you who have visited Norfolk Island will have tasted some of these delicious dishes, while enjoying the warmth and kind hospitality which is a Norfolk tradition. All these recipes contain useful tips and hints from yesteryear .... which still work today. Each book you buy generates funds to assist those less fortunate, not only in the community here, but also with our International projects abroad.